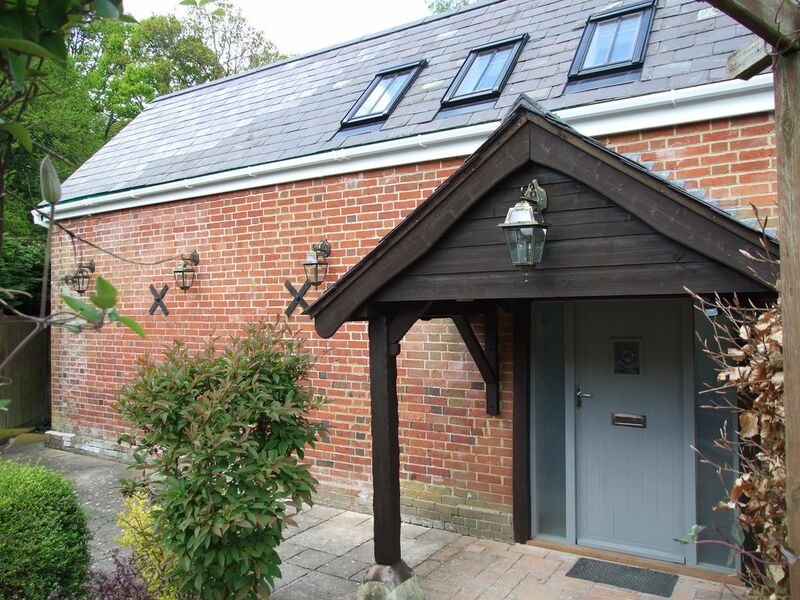 The Barn is a beautifully recently restored one bedroom cottage in the North of the New Forest. It features a mezzanine bedroom and ensuite bathroom accessed by a stunning spiral staircase. There are large feature windows and beautiful old beams, a fully fitted kitchen with everything you need to cook a roast dinner. On chilly evenings you can relax in front of a wood burning fire, whilst the private patio is a real sun trap! Well-behaved dogs are welcomed and will enjoy the Forest walks from the doorstep. Nestled in the ancient North Ridge of The New Forest National Park, The Barn provides a peaceful hideway to relax and enjoy the unique beauty of the forest. Situated within the forest boundary, inside the cattle grid areas, our regular visitors include the famous ponies and cattle that make the forest such a stunning wildlife environment. Whilst deer are a rare sight, we often welcome a small herd into the paddocks, to enjoy some free grazing! The Barn has recently been beautifully restored to provide an open plan living area with a mezzanine bedroom and bathroom, which is accessed by a stunning spiral staircase. The Barn has underfloor heating throughout and a cosy wood burning stove for chilly evenings. The kitchen is well-equipped with a sink, dishwasher, fridge/freezer, electric hob and oven. Dishwasher tablets, washing up liquid, cleaning products, dish cloths and tea towels are provided. Milk, tea and sugar are provided on arrival. The living area has a two seater sofa, a tv and dvd player. Some books and dvds are provided for guests use. There is a wood burning stove for those chilly evenings. The bedroom has a comfortable double bed with hotel quality linen. The bedroom leads to a well sized ensuite bathroom with fluffy towels and plenty of space for wash bags. Outside is a private patio with outside lighting where you can relax in the sun. There is a private parking space available for guests. Together with Mark, my husband, we run our holiday cottage business in the New Forest. We love meeting our guests and making them feel welcome. We live on site with our two little boys. Tea, coffee, milk and sugar is provided for that all important cup of tea on arrival. Gorgeous Barn in an idyllic setting! Very cosy and tastefully furnishes. We had a fantastic first trip to the New Forest, staying in beautiful accommodation. Astrid and Mark were very welcoming and made us feel at home straight away. We have fallen in love with the New Forest and it’s ponies and will definitely be back for another visit. We had to find somewhere to stay at short notice in the New Forest and couldn’t believe that The Barn at High Forest Cottages was free, as it usually isn’t. We were attracted by the location and reviews and weren’t let down. The property was even better than the pictures suggested and was perfect for the two of us and our small dog (well behaved ones allowed) for our 3 night stay. It is an open plan small barn conversion with the bedroom and bathroom up a spiral staircase on a mezzanine floor. The ground floor is split between the kitchen and living area complete with widescreen TV (not that you’ll need it with the views outside) and wood burning stove in the corner, which was very welcome, although the whole place is kept lovely and warm already with the underfloor heating. The whole finish was first class and every feature and the furnishings have clearly had a lot of careful thought. There was a helpful guide to the local area including shops and pubs which we took advantage of. Although in the New Forest proper, it is still convenient and not very far from surrounding villages although you will need a car to get there, unless you are the sturdiest of walkers. We’d definitely recommend it and were made to feel very welcome by Astrid and Mark. Thank you! Lovely property, very comfortable and easy to travel to tourist attractions in the New Forest and beyond. Beautiful scenery and had everything we required for the holiday. Mark and Astrid were good hosts and very friendly and helpful. The property is well located on the edge of the New Forest, with easy access to good pubs, walking and cycling. The barn itself is very comfortable and well equipped, and makes excellent use of the space. We felt very at home there. Astrid, Mark and family live on site and are always on hand if there are any questions. Had a fantastic stay in this beautifully converted Barn in the heart of the New Forest.Contemporary styling but cosy too makes this an ideal place to get away from it all. There was thick snow on the ground when we came for our weekend so we didn't get to explore the area but we hope to return in the better weather to do that. Mark and Astrid are wonderful hosts, we felt very welcomed.